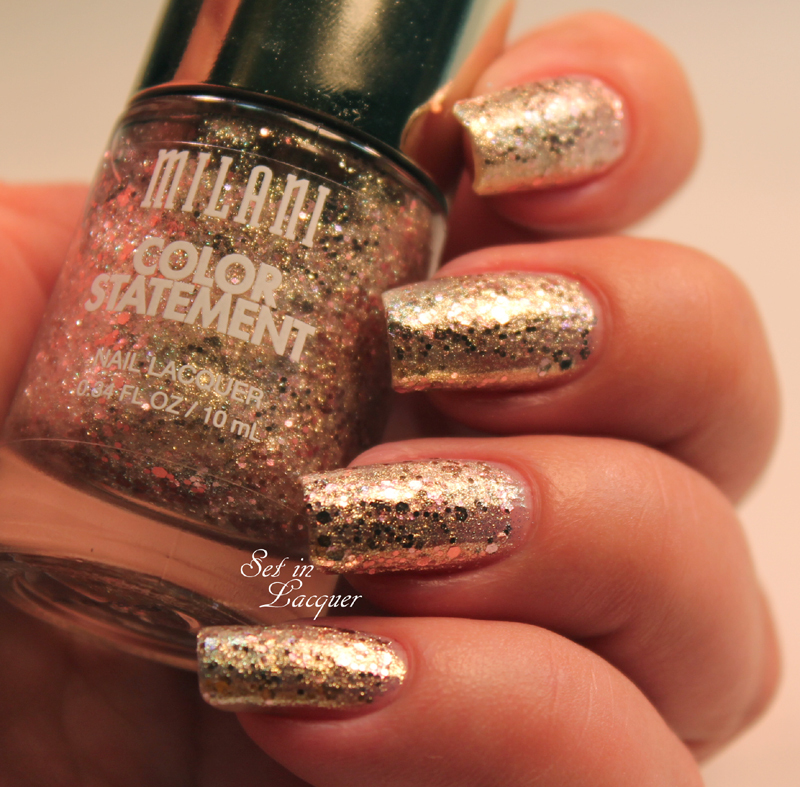 I have the new Milani Fierce Foil Nail Lacquer to share with you today. Vibrant colors that are laced with genuine gold. There are six fiercely pigmented shades named for Italian cities. 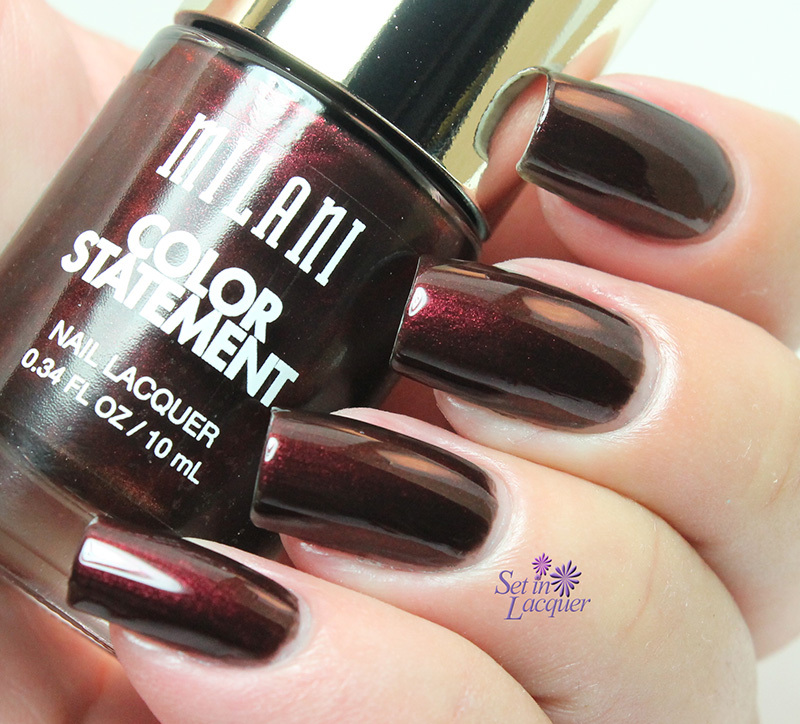 Milani has affordable polishes that are quality and infused with color and shine. These polishes are no exception. The gold flecks add depth, dimension and a slight texture. They apply relatively easily and the gold flecks rest flat against the nail. They are a bit on the sheer side. I used three coats and a top coat for all of the swatches. Capri is a vivid bright pink with gold flecks. This fun petal pink is sure to be an eye-catcher. Florence is a fun sage green shade. It's infused with gold flecks that give the polish depth and texture. This one is probably one of the most textured of the collection. 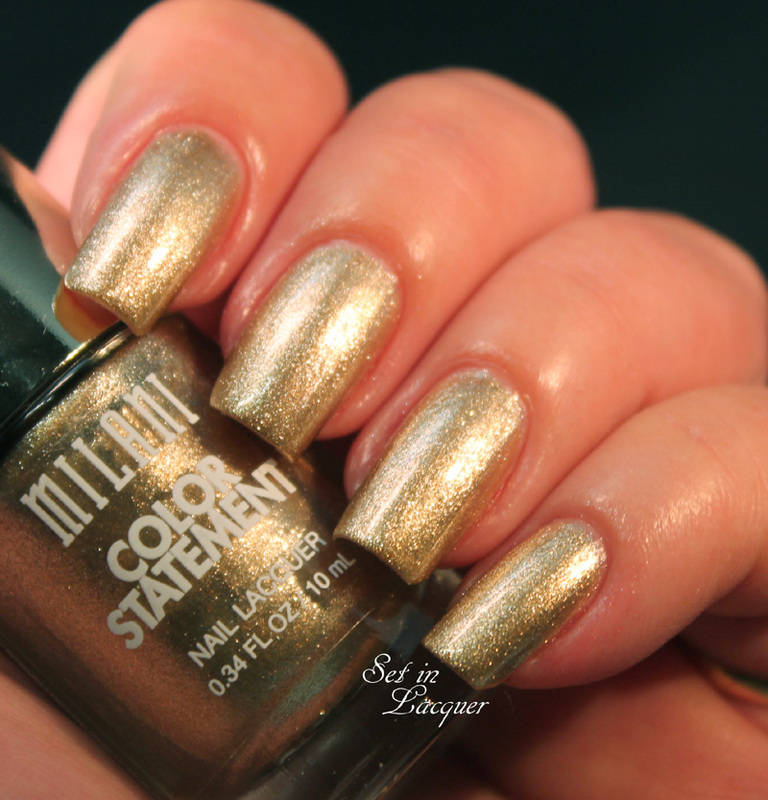 Milan is a dazzling shimmery gold flaked polish. 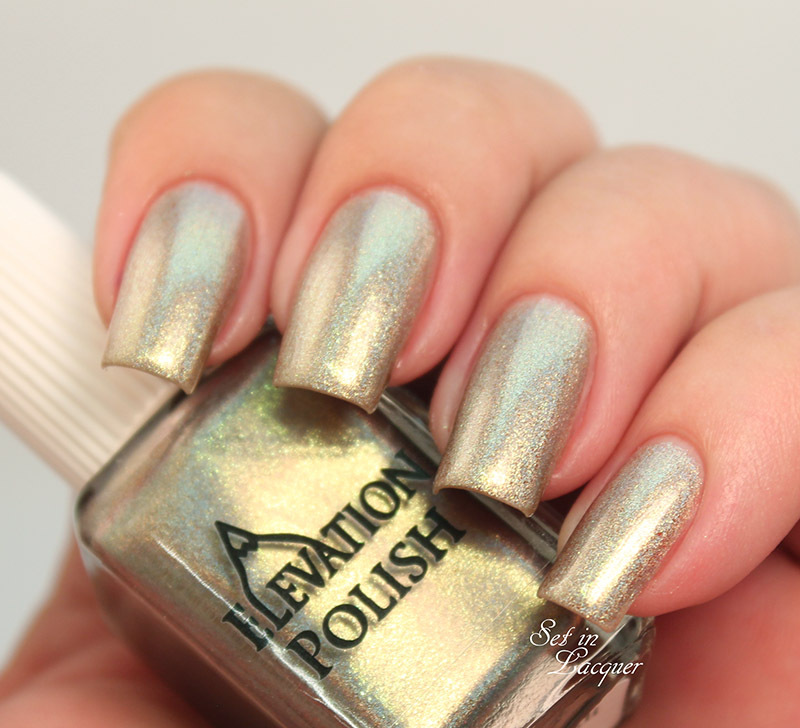 This rich polish is sure to be perfect for those sun-drenched days, or those moonlit nights. 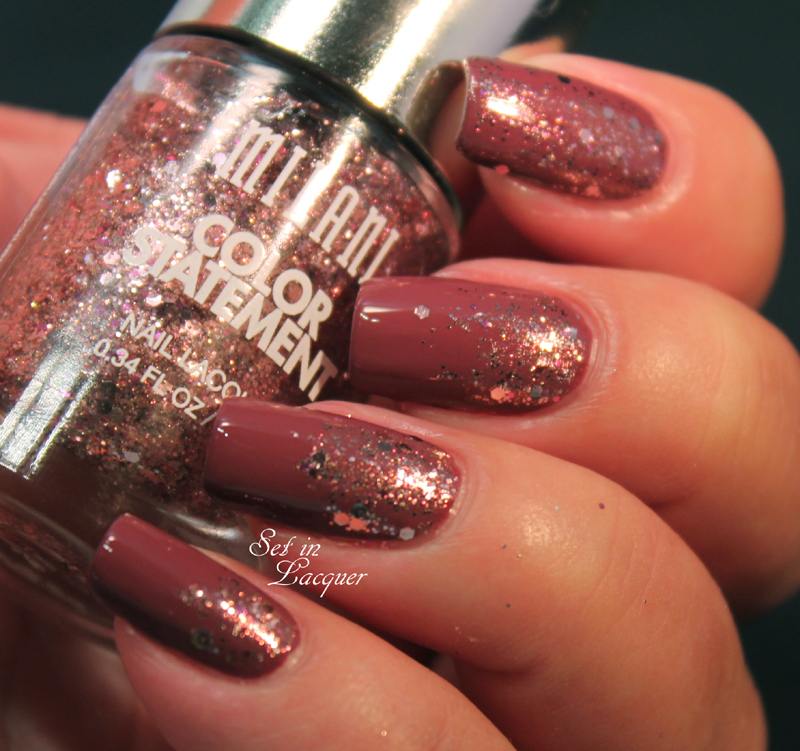 Rome is a brushed orchid shade that has smaller gold flakes that the other polishes in the collection. It is extremely smooth and the color is gorgeous. Sardina is a sheer ivory white with light and gold flakes. It is quite ethereal in its appearance and would look great with one coat over a white base. 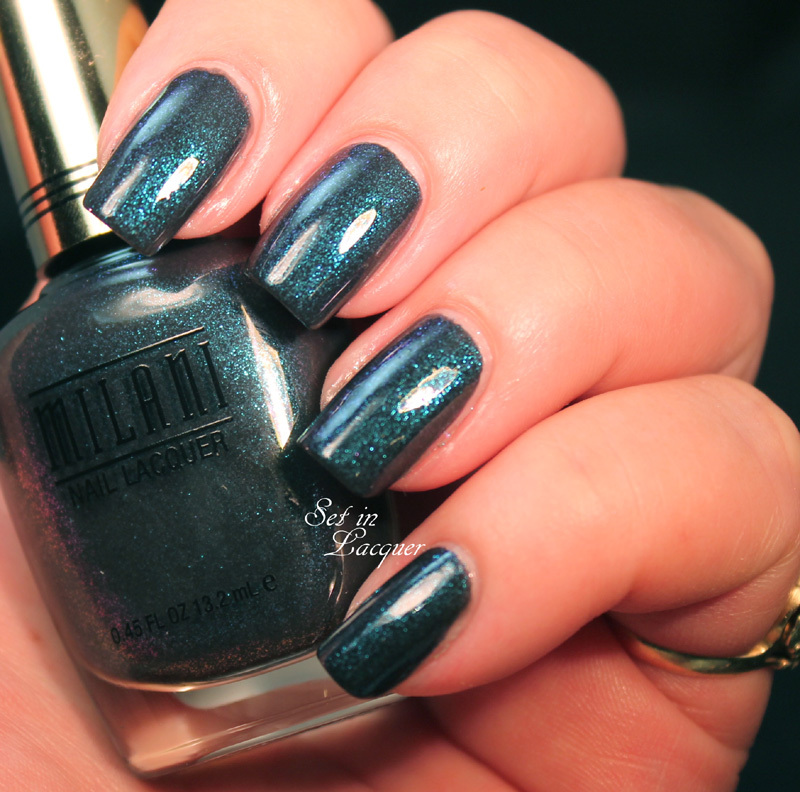 Venice is a stunning navy blue with shimmer and flakes. This rich blue shade is a classic. These polishes, although on the sheer side, are easy to apply and the third coat of polish definitely makes them pop. Try them over a complementary shade and you have several looks from one polish. 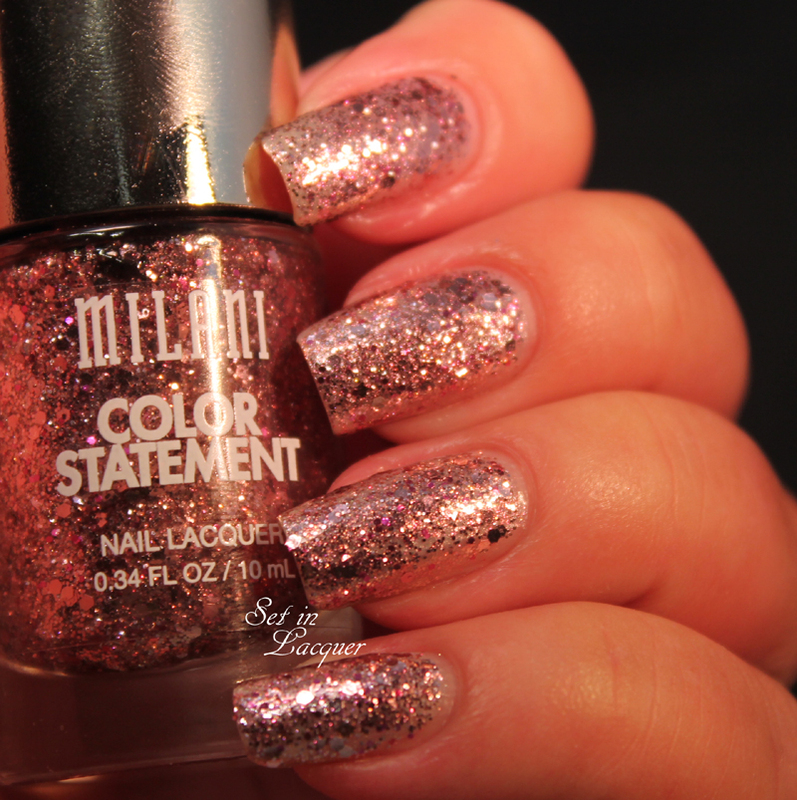 These Milani Fierce Foil nail polishes are available at most drugstores (Walgreens, CVS) for $3.99 or online at milanicosmetics.com. 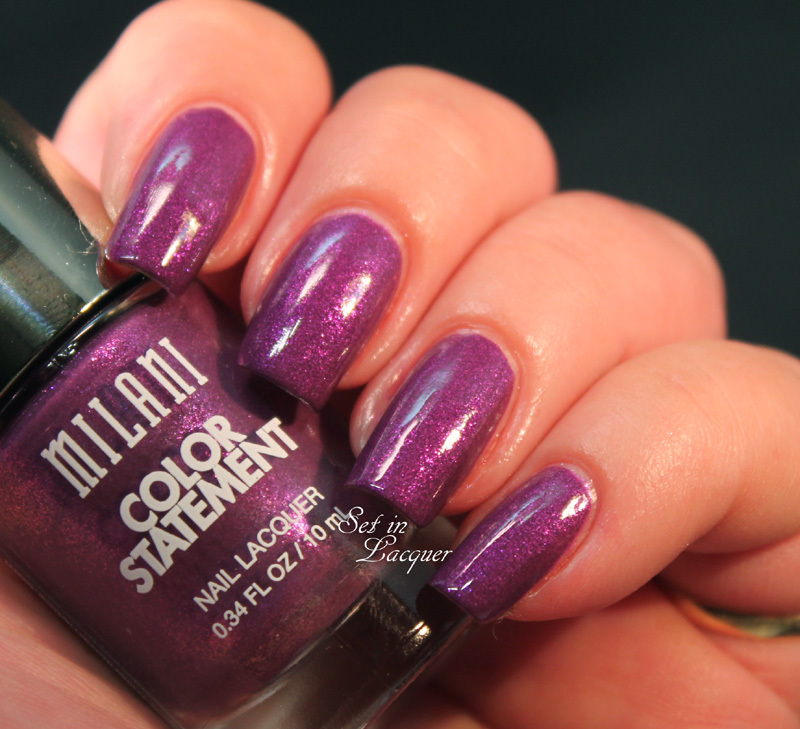 Follow Milani on Facebook to get news on upcoming collections. 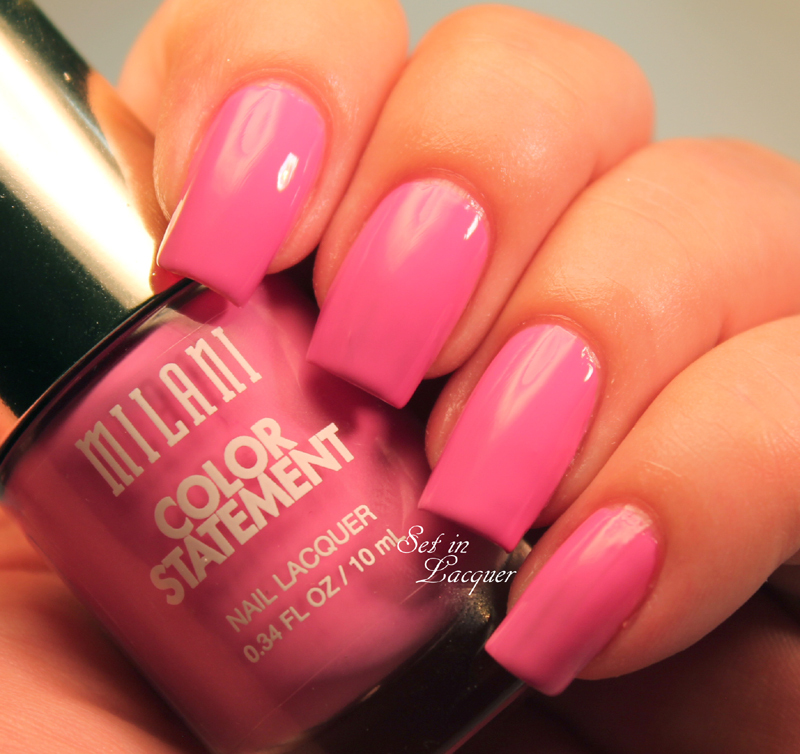 Milani has some amazing polishes. They are affordable and quality polishes. I have one to share with you today from the Fall 2014 collection. Enchanted Garnet is a gorgeous shimmery deep shade of red. Well, actually... it's garnet. But the shimmer in this one is phenomenal. It comes to life in all lighting. It is a bit more subtle in low lighting. But you can still see it. Let's take a look. I used two coats and a top coat for this swatch. I had no problems with application. 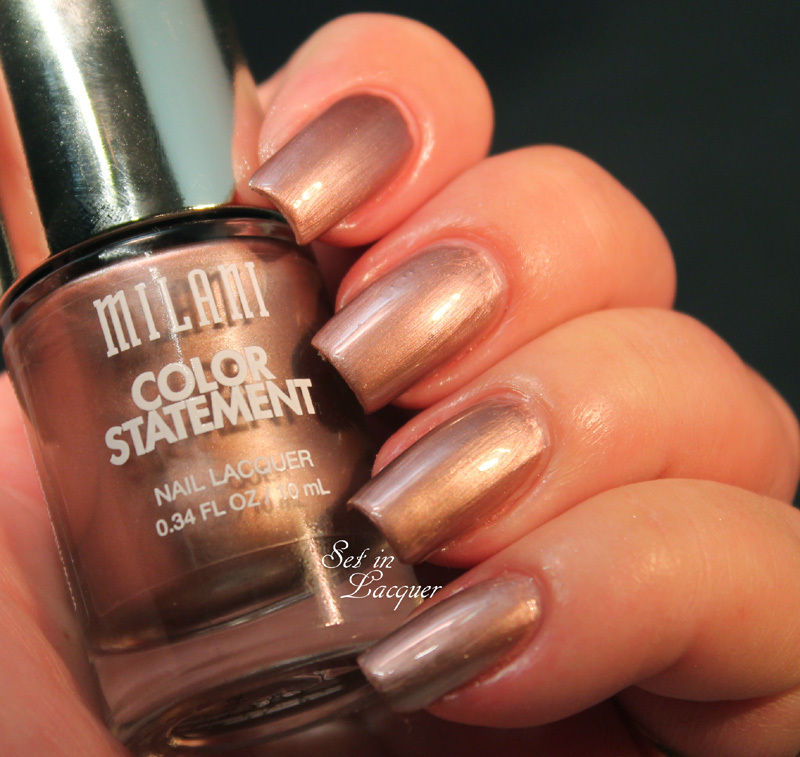 Milani nail polishes are available at most drugstores (Walgreens, CVS) for $2.99. You flex your fingers in preparation, shake your shoulders to loosen your muscles and it's on... You repeatedly click the F5 key fast enough that it wouldn't surprise you if smoke erupted. It's time - you curse at the computer and scream for the Internet to be faster. If you're lucky, you snag the one you want; and try not to let temptation lead you astray. You quickly navigate to PayPal and complete your purchase. If you aren't that lucky, you continue to wear out the F5 key in the hopes that someone, somewhere, will drop that polish. This is how it is for me and Elevation Polishes. I seldom get to do the victory dance at the end. But the thrill of the hunt keeps me going. The last Elevation Polish launch left me humbled. But I did manage to snag a couple from her new Italian Collection! Let me share Tre Cime di Lavaredo with you. Tre Cime di Lavaredo is a gorgeous linear holographic gold. It flashes with shades of copper, gold, blue, rose and all the colors in between. It's one of those polishes that mesmerizes you with the color shifts. 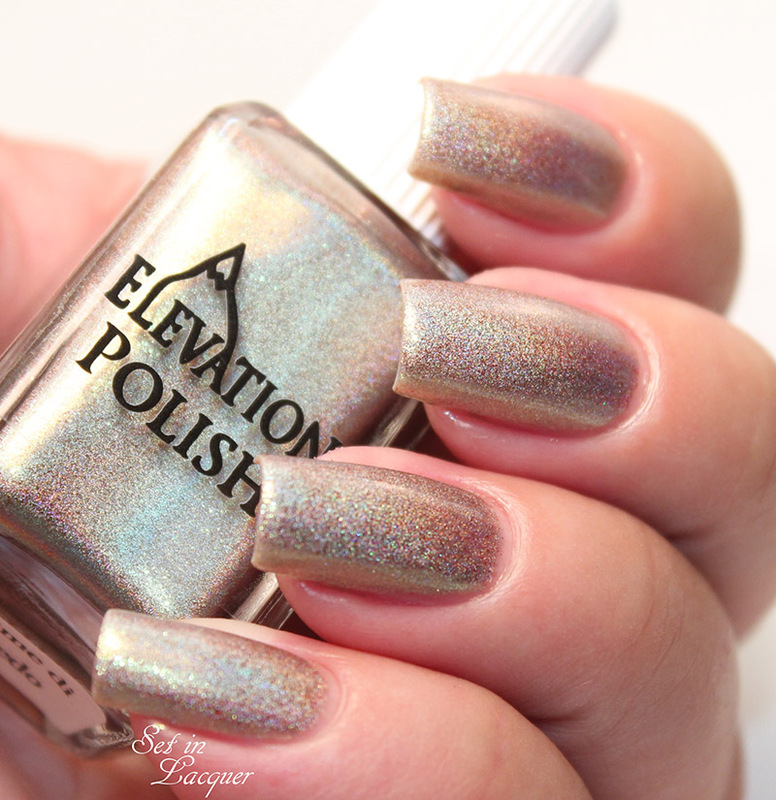 The holographic shimmers and tiny flakes make this polish a winner. It's become my favorite gold nail polish. This is two coats. This swatch is in a low level lighting with direct light. But it shows the amazing color shift of this polish. I had to try a little bit of nail art with this one. 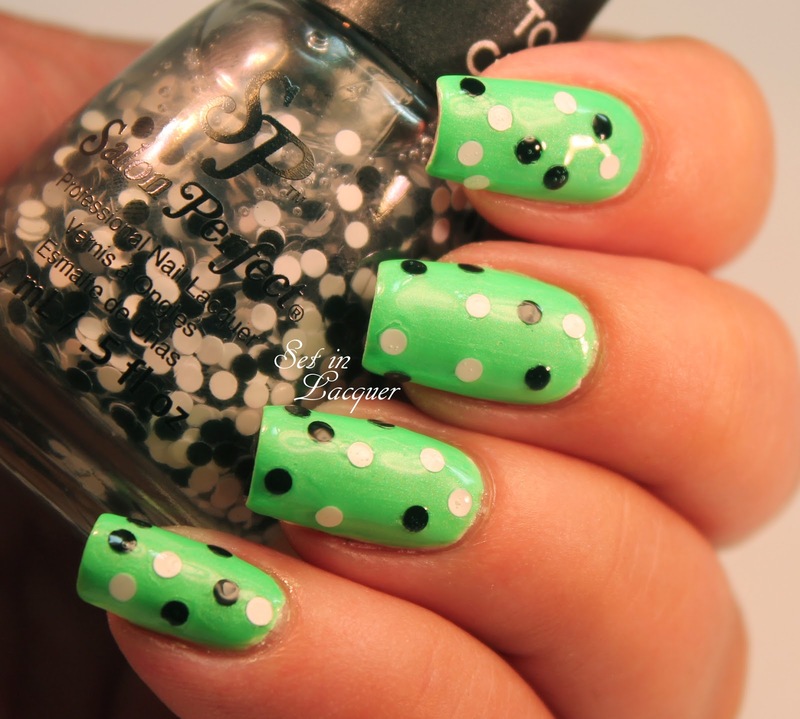 This is an easy nail art look to recreate. 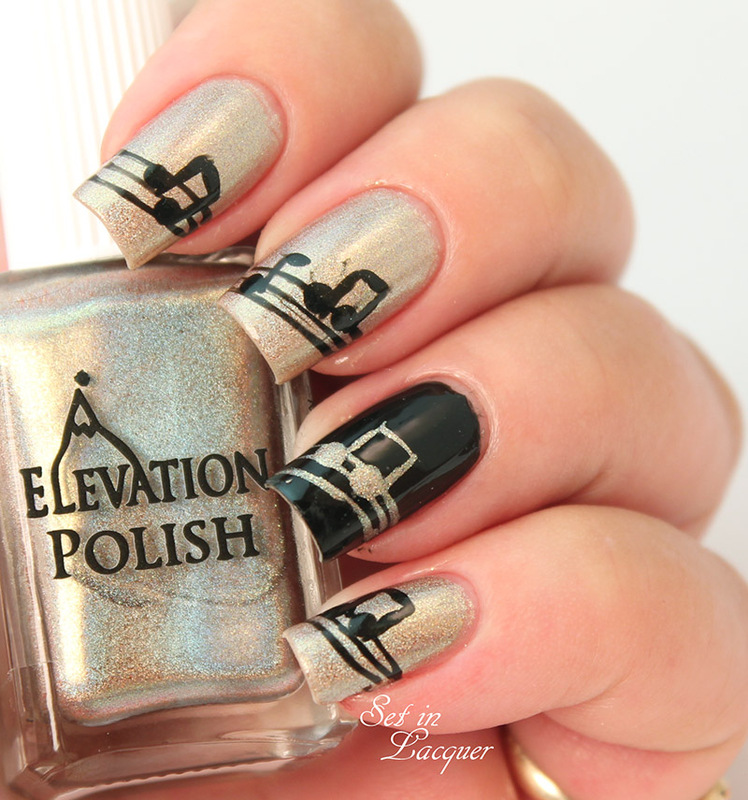 I used Tre Cime di Lavaredo, acrylic paint and Milani Black Swift to create this musical themed nail art. It's perfect for the "dance." 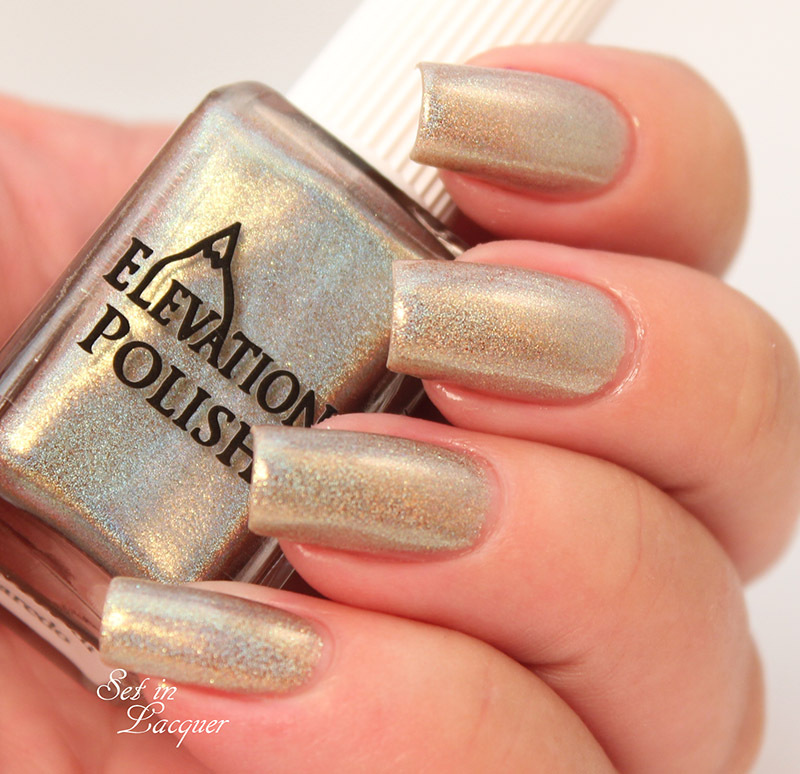 New Elevation Polishes are launched on the 7th and 22nd of each month. However, there are polishes available all the time. They can also be purchased at llarowe.com. See you at the next dance! From Lana Del Rey's retro bombshell style to Zooey Deschanel's signature cat-eye look, there is no denying that mod is right on trend. The 1960s mod era introduced a more playful approach to beauty and the use of color. +Salon Perfect has introduced "Nailed by the Mod Squad Collection." And it's definitely right on trend. These Limited Edition Top Coats will add color, texture and style to your manicure. There are three top coats in this collection. There is sure to be a top coat for your mood. 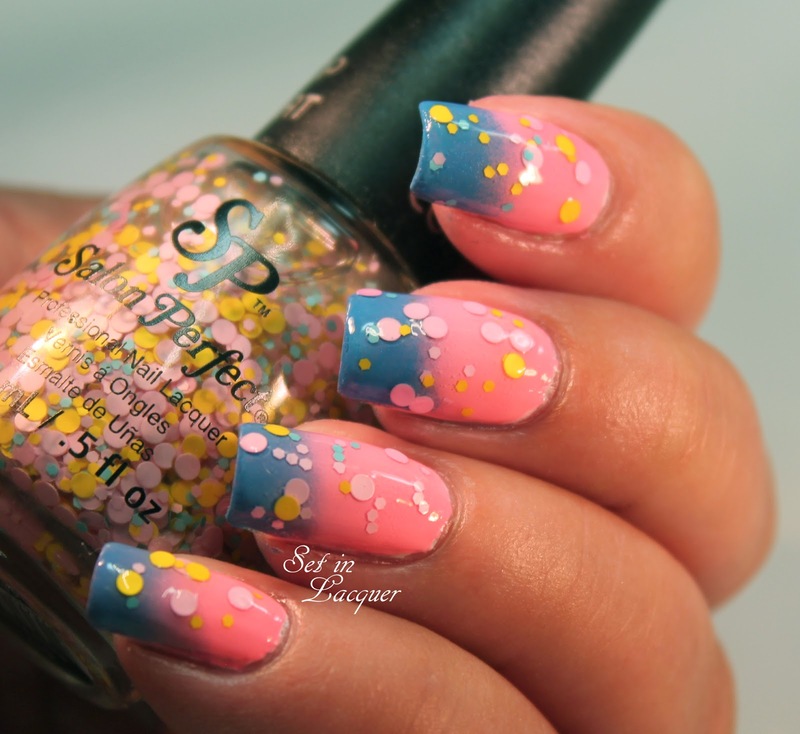 Flower Power is a 60s inspired, pastel matte glitter top coat. 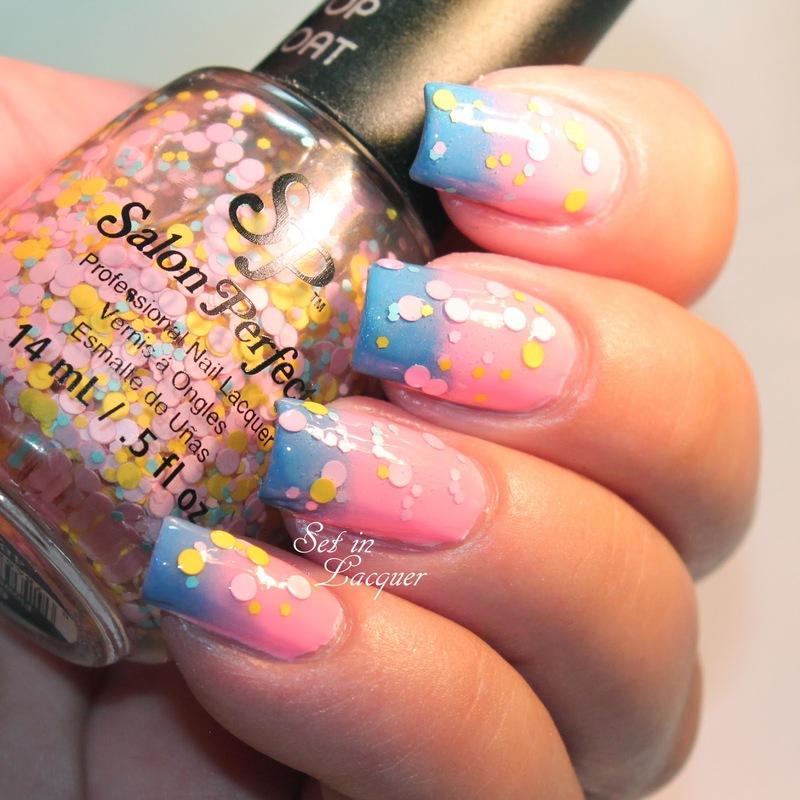 It has varying sizes of pink, yellow and blue round matte glitters. I love the subtle look of this top coat. It applied easily and the glitter applied relatively evenly. I applied it over a Salon Perfect Tickled Pink and Wild Blue Yonder gradient. I adore how the look came together. 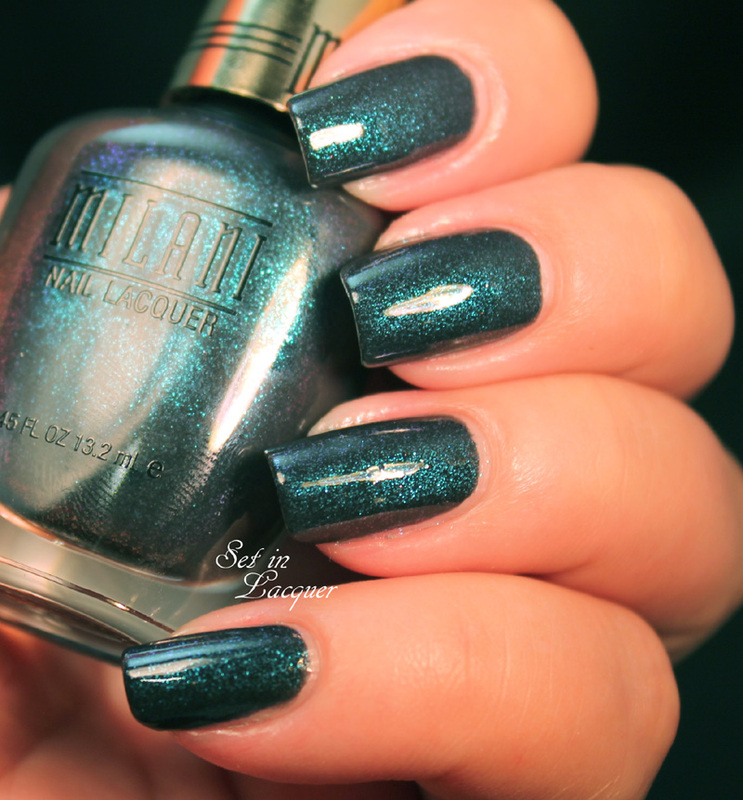 Mad About Mod is a gorgeous 60s inspired, pastel matte glitter top coat. 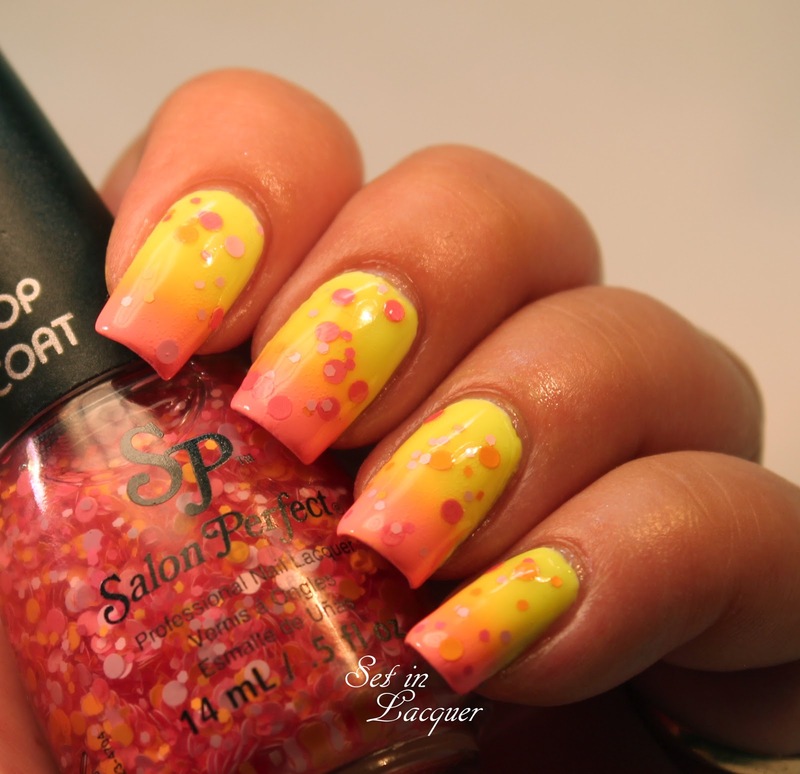 It has varying sizes of pink, yellow and ever so light lavender round matte glitters. This is my favorite of the 60s polishes. It applied well and the glitter applied relatively evenly. I applied it over a Salon Perfect Tickled Pink and Yowza Yellow gradient. 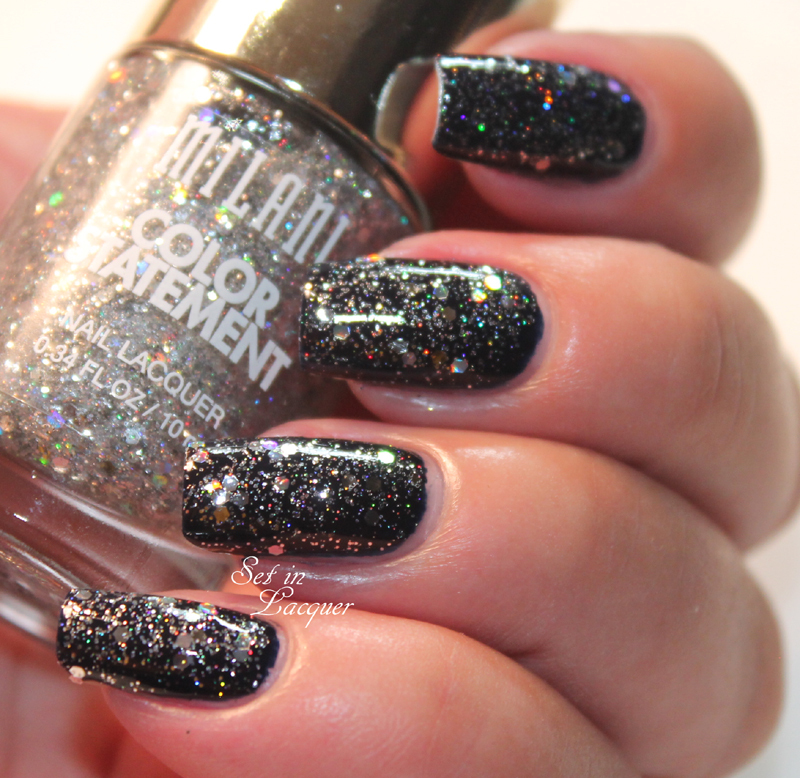 Spot On is a mod-inspired black and white matte glitter top coat. You will be seeing spots with this one. Spot On did take effort to apply. The glitter had to be fished out at times and then it took some work to apply the glitters evenly. But it wasn't too hard - It will just take a few extra seconds of time. And the final result is dramatic. I applied it over Salon Perfect Loopy Lime. Which is your favorite? Mine is definitely Mad About Mod. These Salon Perfect Polishes will be available in August at select +Walmart stores nationwide for $3.98. 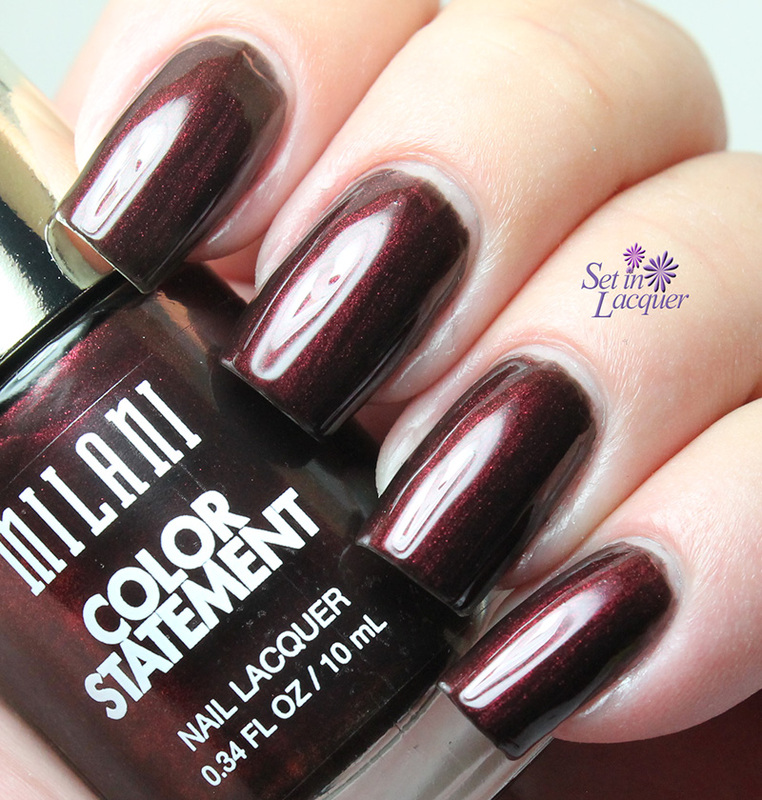 Milani has released a new collection - Color Statement. And does it make a statement! It has 37 shades of polishes and I am not about to try to fit them all in one post. 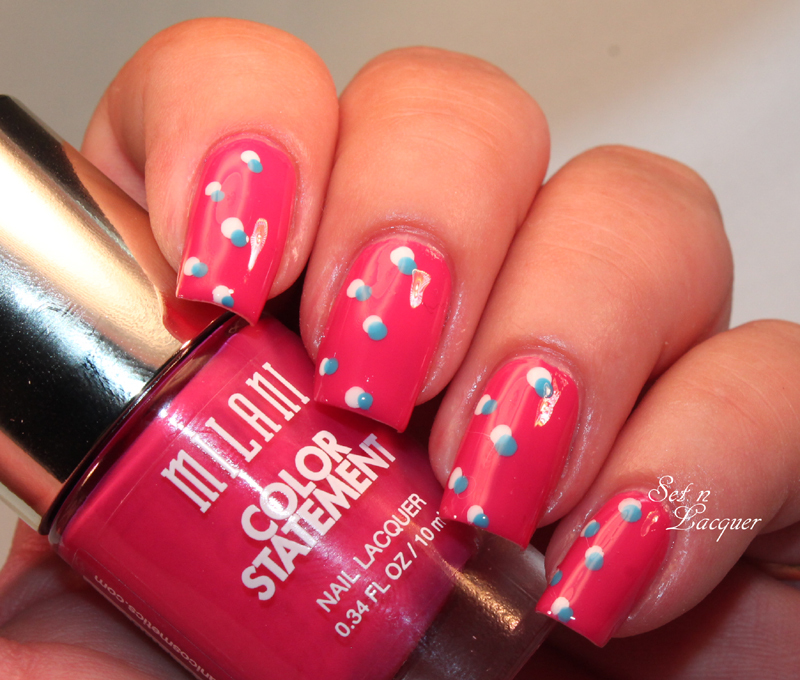 I have some of the cremes and nail art in this post. You can see the shimmers and metallics in this post and the glitters can be seen here. Stay tuned for more cremes! The colors of these polishes is amazing, the formula is nice and they dry very quickly. They did dry almost too fast for nail art, but that could also be the weather. Summers are extremely dry in Wyoming in the summer. Not to mention - it could also be because of all the fans I have running in the house. I have seen some amazing nail art created with these polishes, so I am sure it is one or the other... maybe even a combination of both. 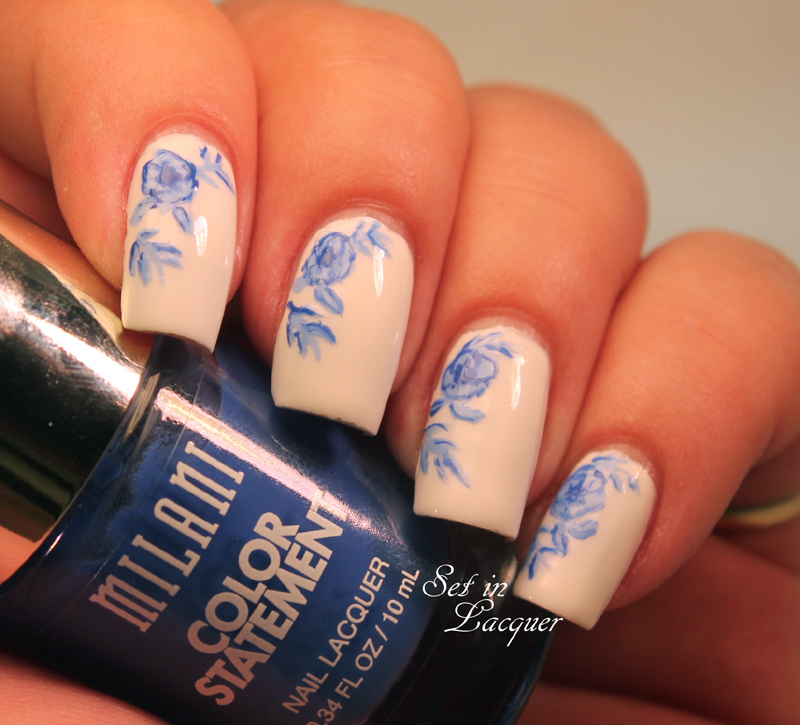 First up is a vintage, dresden-style, floral nail art look. I used Spotlight White for a base color and painted the flowers with Blue Print and Peri-wink. I love how this look is subtle and classic. Mauving Forward is a gorgeous, mauve saturated shade of polish. This is two coats. The color is quite stunning. Hot Pink Rose is a stunning and vibrant shade of a deep, but bright rosy pink. This is two coats. I added dots of Spotlight White and Waterfront. nk Spot is a glossy, true black creme polish. It's perfect for a nail art base color, or as a stand-alone polish. It applies wonderfully. This is two coats. Mango Tango is one of my favorites! 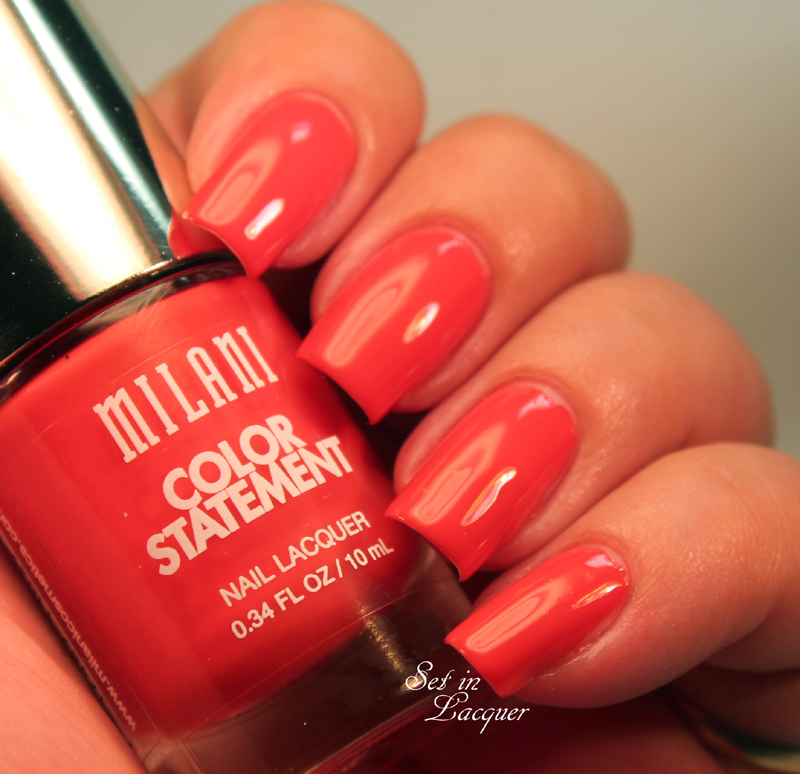 Who couldn't love this shade with it's mango saturated creamy and glossy color? Put a cherry on it... it's dessert. This is two coats. Spotlight White is the perfect, glossy, pure white cream polish. It applies well. As with a lot of white polishes, it did take an extra coat. This is three coats. This polish will be a staple for those who like a white base for nail art. Cupcake Icing is a sweet treat of a vivid pink creme. Its stunning! This is two coats. It's bright and eye catching. Blue Print will take care of the summer days blues. 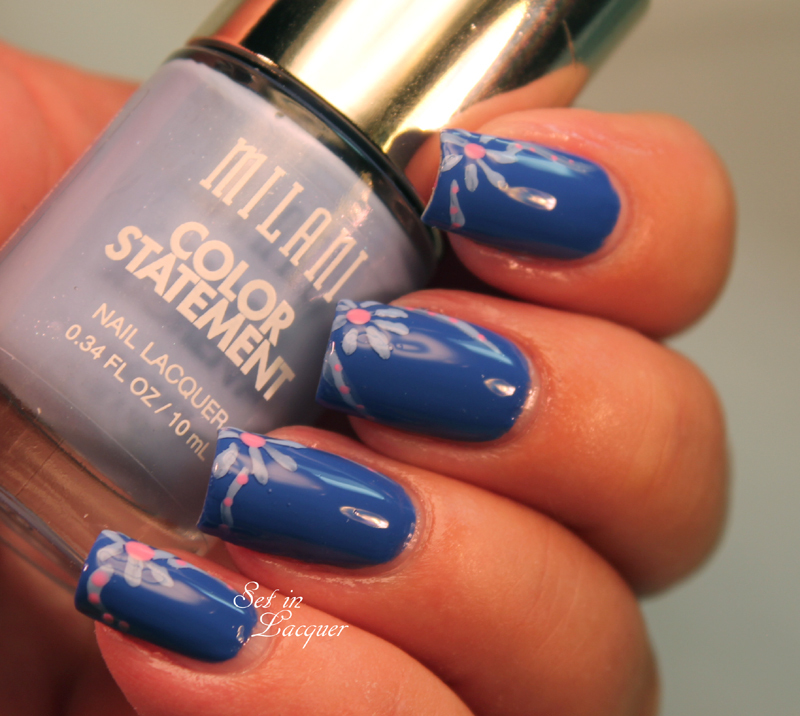 This brilliant blue is stunning and applies well in two coats. I added some simple flowers to Blue Print with Peri Wink and Cupcake Icing. It is just the right amount of contrast and is fun and summery. Which of these are going to adorn your nails? Watch for the rest of the collection coming up soon! 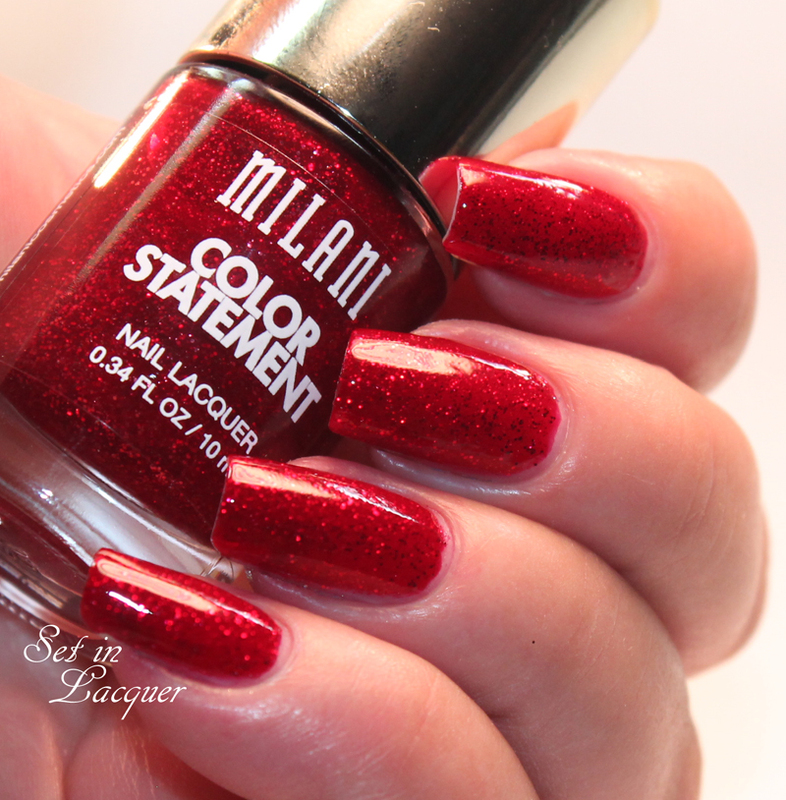 Milani has released a new collection - Color Statement. And does it make a statement! It has 37 shades of polishes and I am not about to try to fit them all in one post. 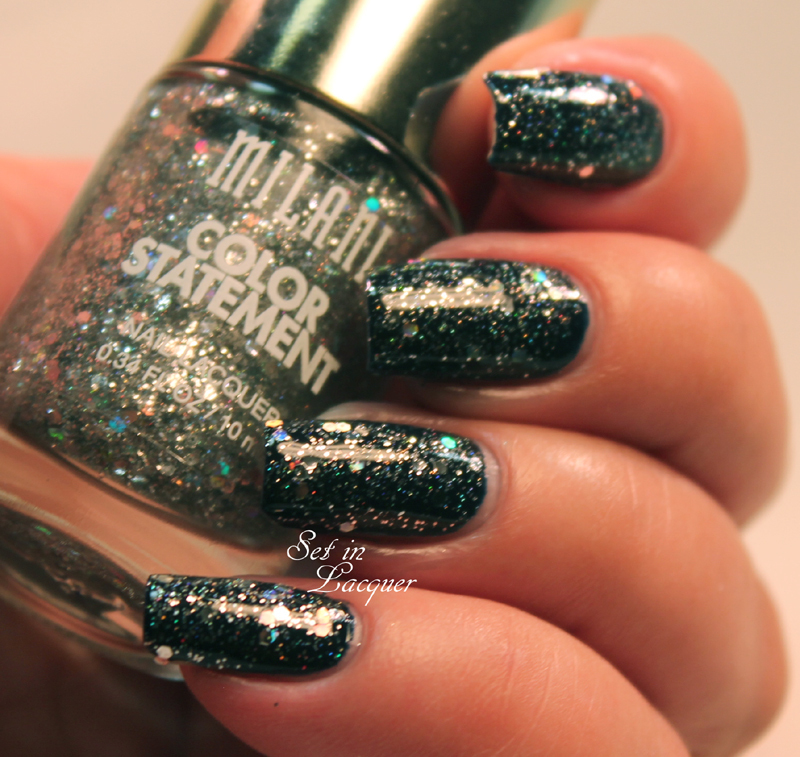 I am sharing the glitters in this post. You can see the shimmers and metallics in this post. And stay tuned for the cremes! This is your time to shine with nails that drop-dead dazzle. 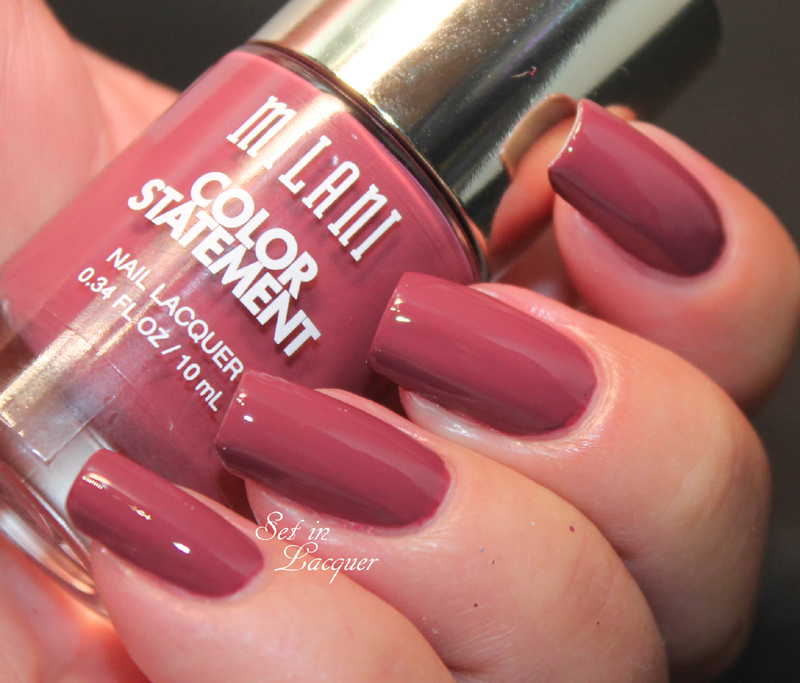 Milani Cosmetics New Color Statement Nail Lacquer lets you fall in love with your nails all over again. Comprised of the richest, most color-saturated formula, delivering a long list of patent pending promises to ensure exceptional gloss that actually lasts. 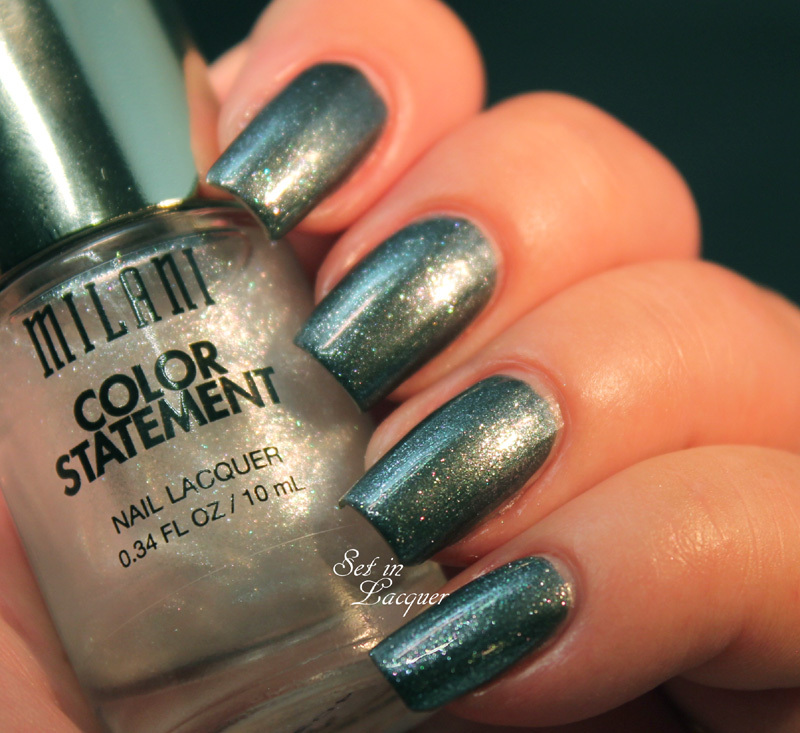 Color Statement Nail Lacquer is detergent and chip-resistant, providing maximum nail protection. It's available in a variety of different finishes - cream, sheer, metallic - and an abundance of shades - 37 in total, from neutrals to full-on fashion hues - this groundbreaking collection is packaged with a unique even-glide brush and brings flawless fashion straight to your fingertips. Let's take a look. There are four glitters to provide a treat for your nails - and your eyes. 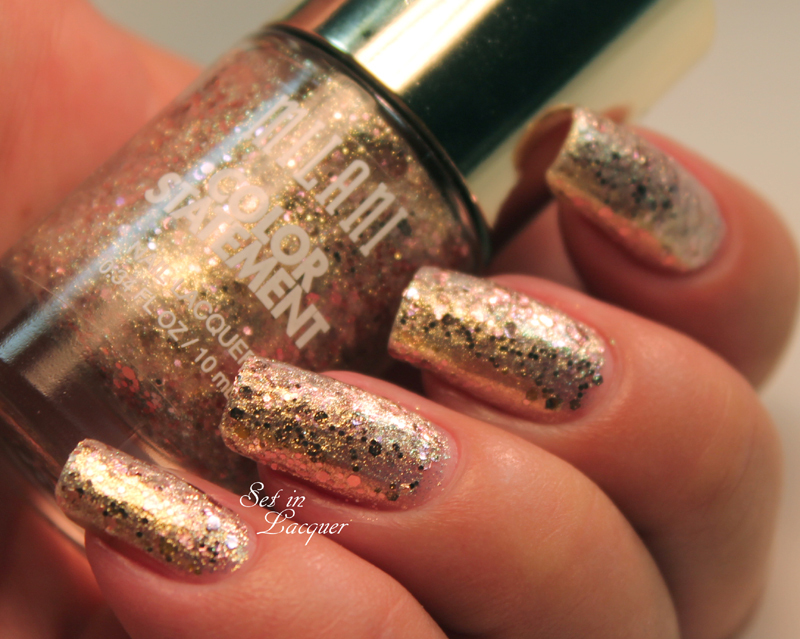 Club Lights is a glitter topcoat that is chocked full of multi-shaped golden rose colored glitter. I applied it over the full index finger and partially on the other nails. It looks great over Mauving Forward. There wasn't any fishing for glitter and the pieces applied evenly. This is three coats of Club Lights with a top coat. It applies wonderfully. 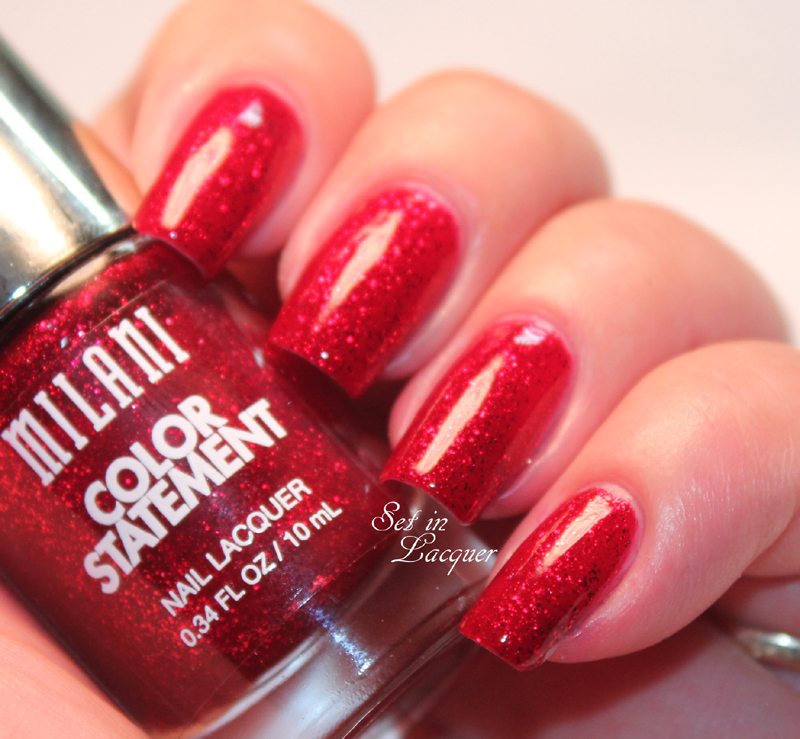 Crimson Jewel is a glitter infused jelly polish that is a gorgeous and classic red. The shimmer from the small glitter comes from within. This is three coats with a topcoat. 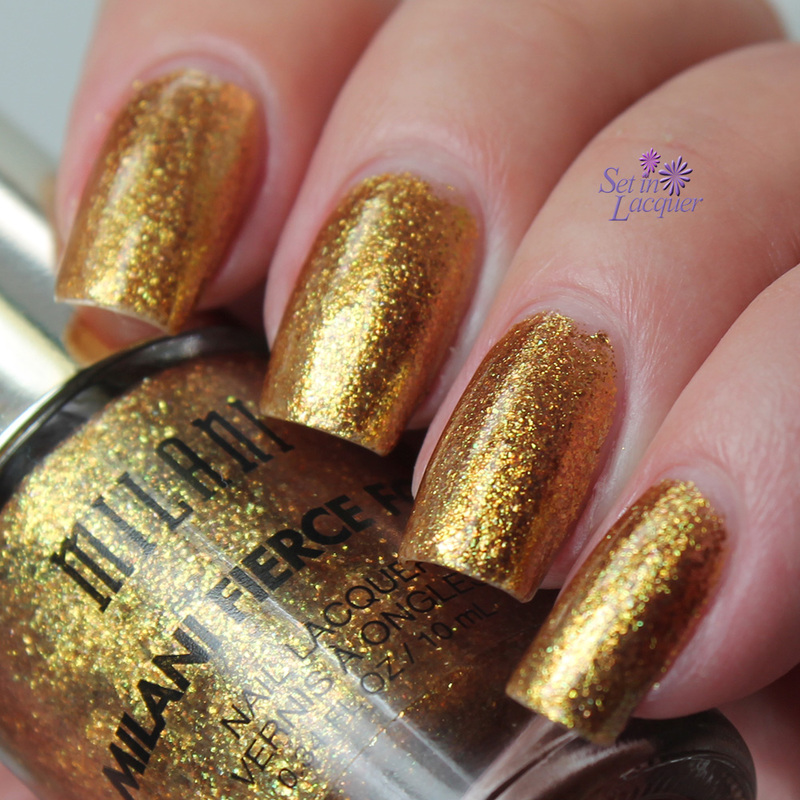 Gilded Rocks is a golden glitter polish that can be easily worn by itself. The golden glitter pieces are immersed in a golden hue base - so it covers the nail easily. This is two coats with a top coat. 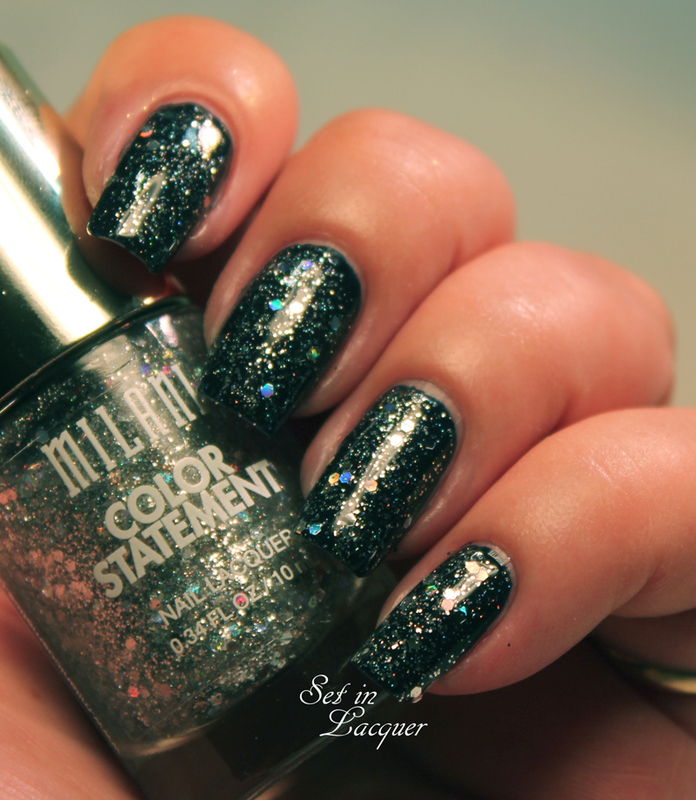 Rainbow Prism is a silver glitter topcoat that is chocked full of multi-shaped silver holographic glitter. It looks amazing over Ink Spot. There wasn't any fishing for glitter and the pieces applied evenly. 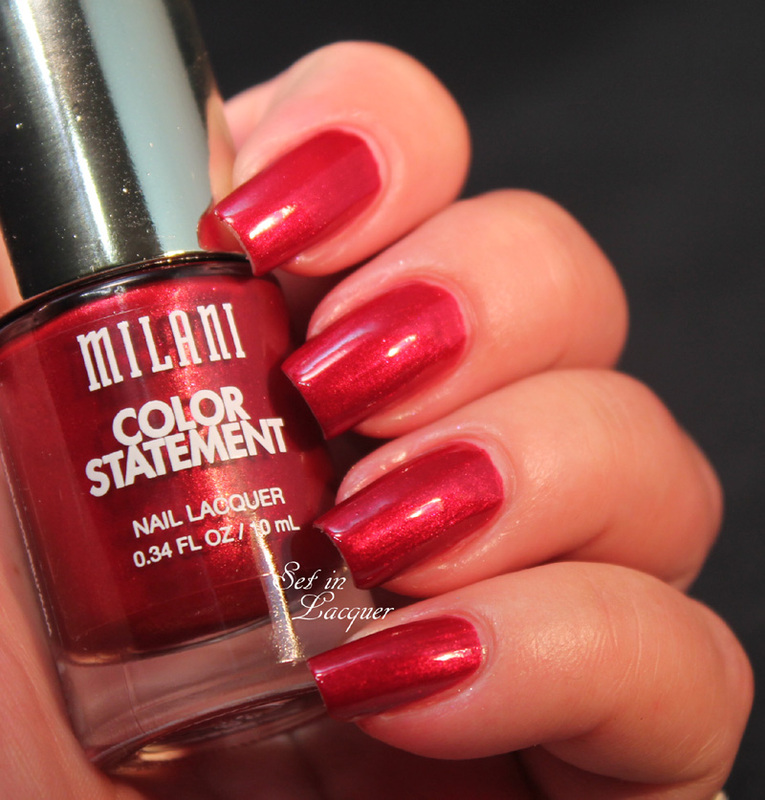 Milani has released a new collection - Color Statement. And does it make a statement! It has 37 shades of polishes and I am not about to try to fit them all in one post. So this post has the shimmers and metallics. Let's take a look. All of these are two coats unless I mention otherwise and they all have a top coat of Milani Color Statement Quick Dry Top Coat. This frosted metallic is a wonderful shade of taupe with a bit of copper sheen (Hmmm, maybe that's why it's named "Bronze.") I had no issues applying this one. It didn't even leave any obvious brush strokes. 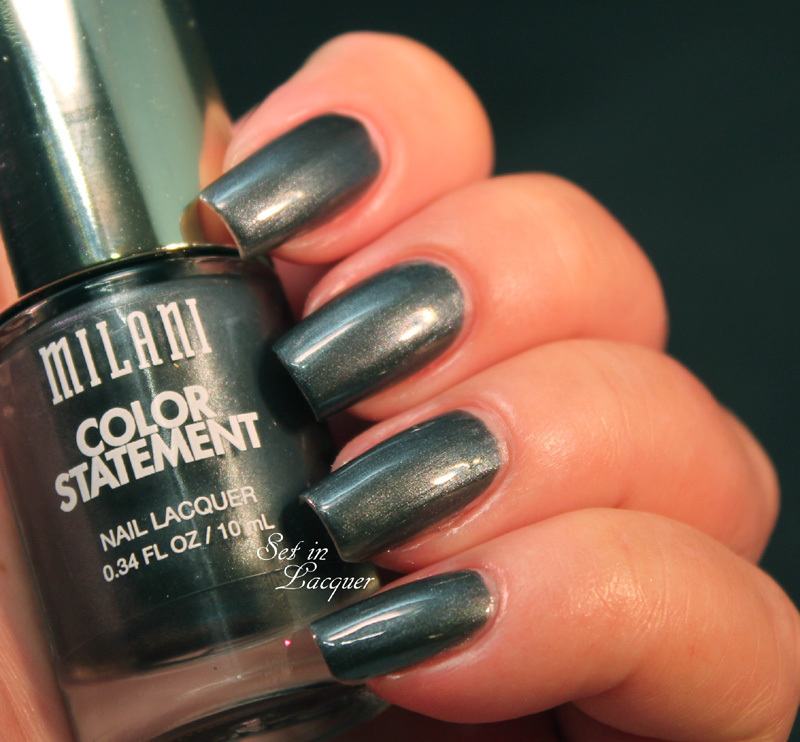 This frosty metallic is a stunning deep charcoal gray. 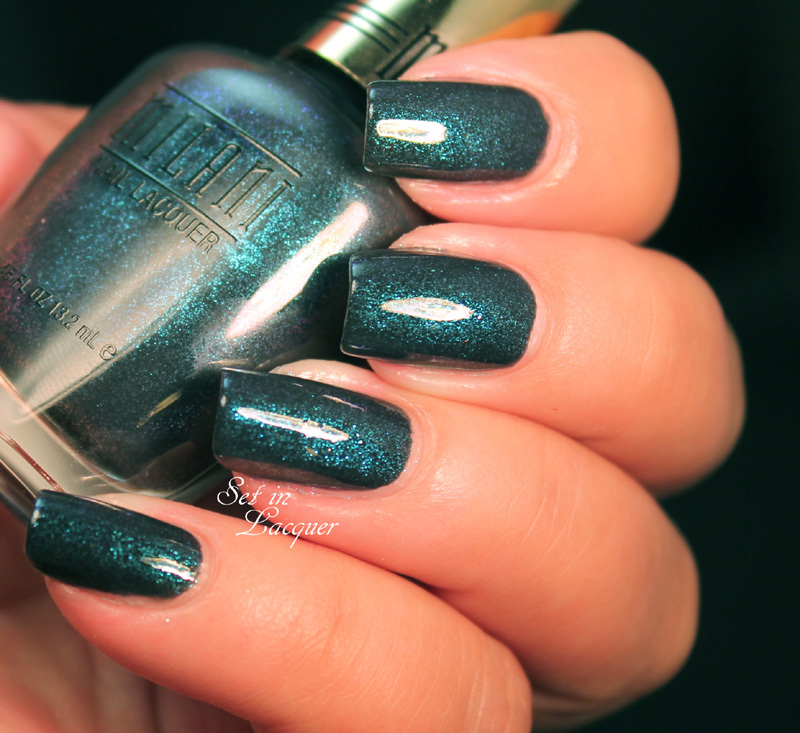 The subtle shimmer adds a depth to this polish. I had no issues applying this one. This frosty polish is a light and classy shade of lavender. I had no issues applying this one - although it did leave a few more brush marks than I like. But they aren't over powering. This polish could be worn on its own with several coats. But I used it over Charcoal Charm. It adds a pearl shimmer that catches the light. I like this like and airy polish. 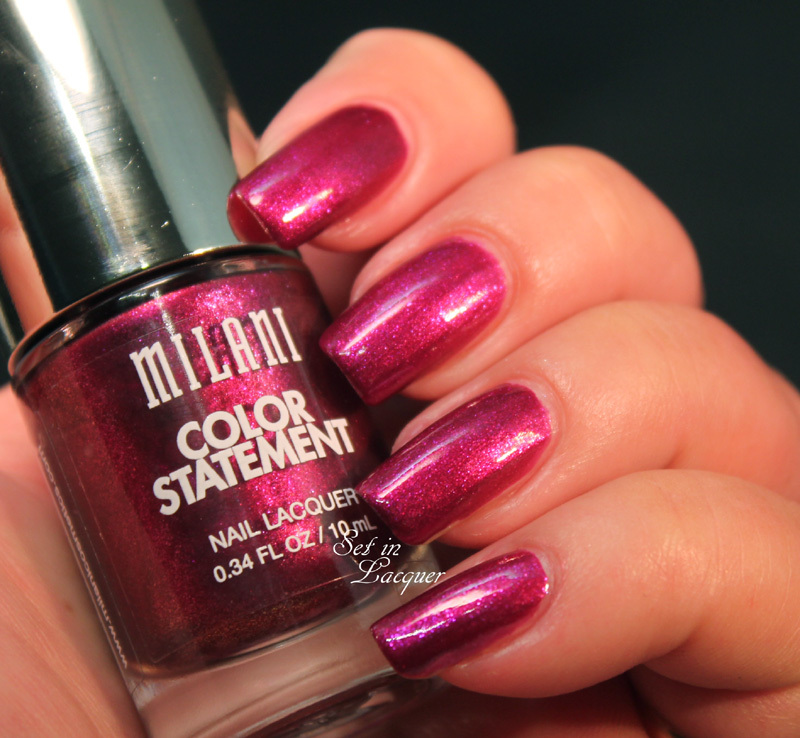 This shimmery magenta polish is vibrant and sure to be an eye catcher. The shimmer is the type that seems to be from within the polish. I had no issues applying this one. 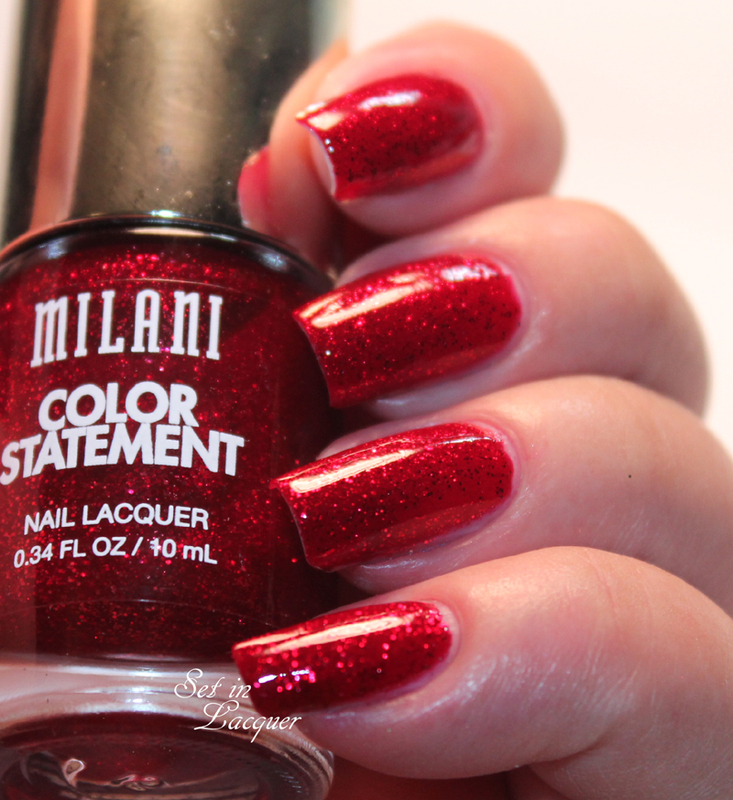 This shimmery classic red polish is simply stunning. 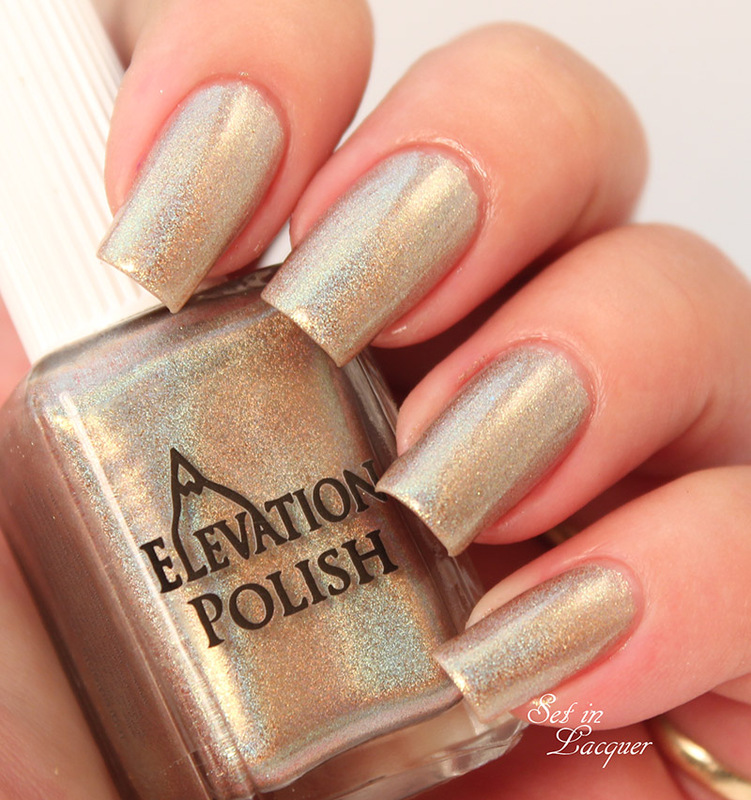 The shimmer is subtle and adds a tremendous amount of depth to the polish. I had no issues applying this one. This gorgeous deep violet polish is filled with shimmer and shine. 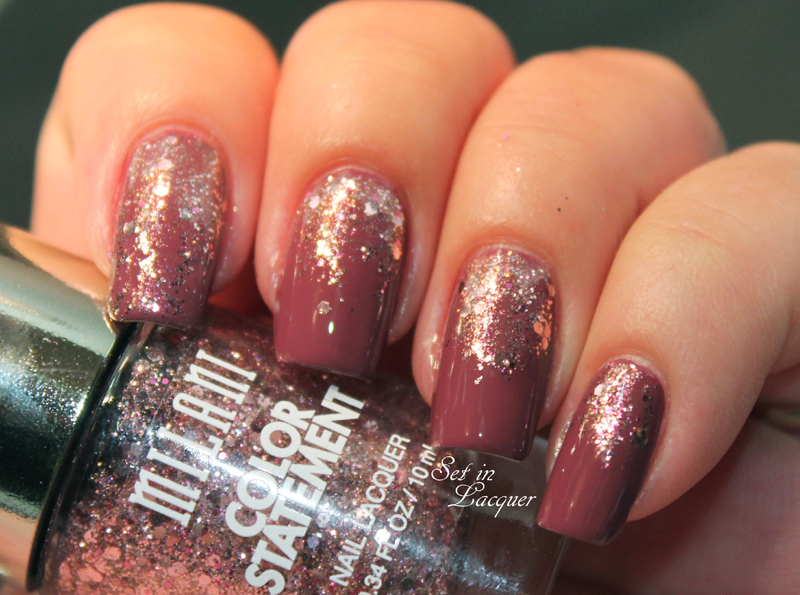 The shimmer is gorgeous and has a hint of deep pink. I had no issues applying this one. Which of these are you going to snag? Watch for the rest of the collection coming up soon! 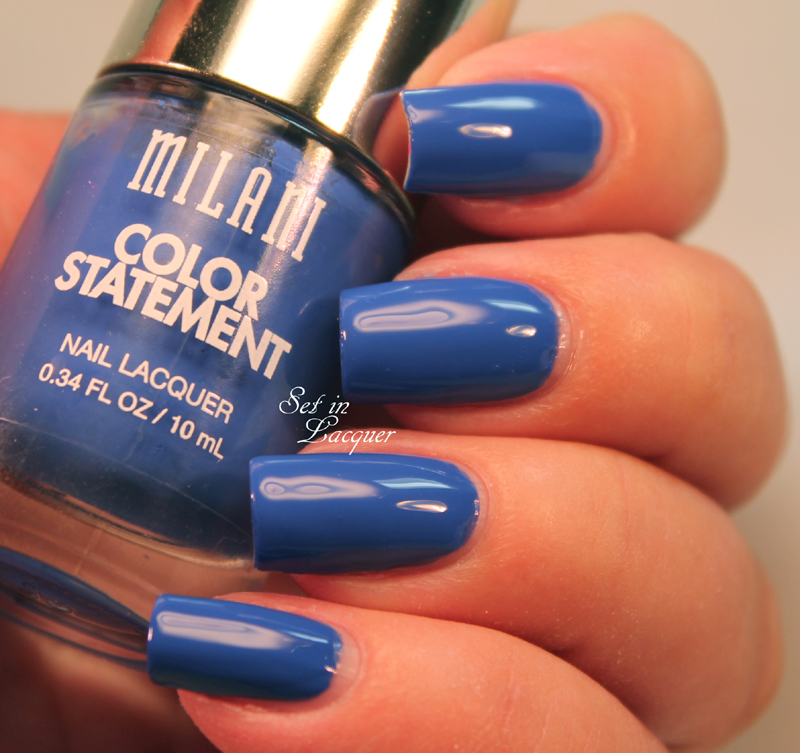 I have the new Milani Limited Edition Bella Blue polish for you today. 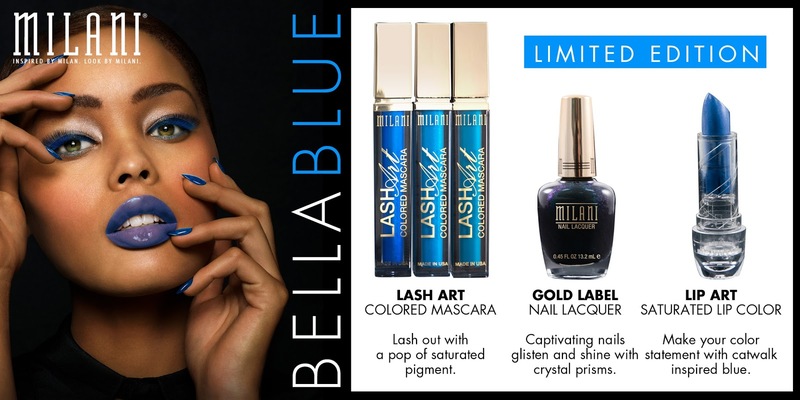 It is part of a Bella Blue Collection that contains colored mascara, nail polish and saturated lip color. The blues are amazing and vibrant. 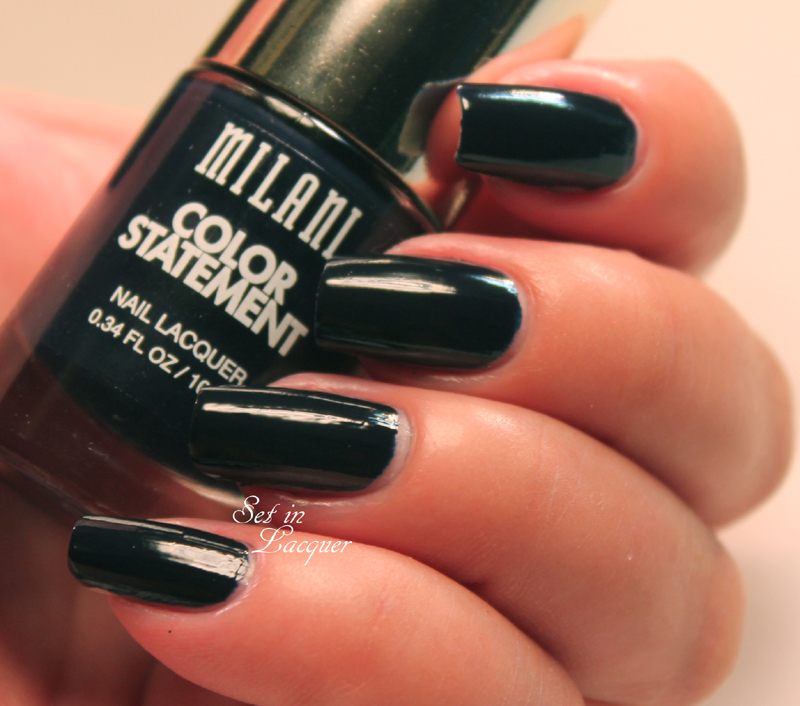 And Milani is always a quality product, at an affordable price. So let's take a look at the polish. 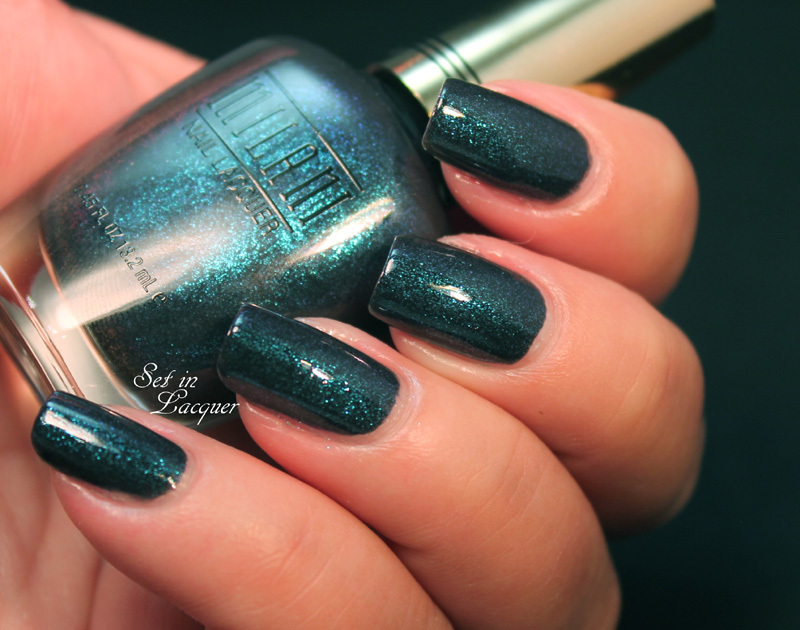 Bella Blue has amazing shimmers of blue, green and purple in a deep, almost black base. It truly flashes with mesmerizing deep color depending on the light. It applied wonderfully. I used two coats of polish and a top coat for these swatches. This collection is available at select Walgreen, Kmart, and Fred Meyer stores for $4.99. This collection is also available online.